Come home to comfort and relaxation in a rural setting where Crossroads Care Center of Weyauwega has created a long-term nursing home with the quality and feel of a 5-Star resort. Yes, there’s peace and quiet in this Wisconsin town of 1,900, but you’ll also have access to an active social life and plenty to do, such as concerts, bingo, crafts and more. 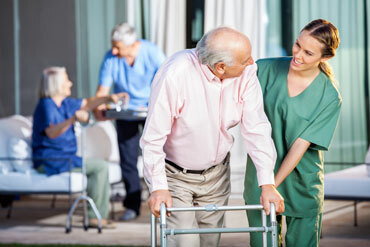 Whether you choose Crossroads Care Center of Weyauwega for long-term nursing home care or short term rehab, you’ll find caring and trained professionals who are dedicated to meeting your needs while providing for the highest possible quality of life. The 5-Star comfort we offer is matched by the same quality of care. Schedule a tour today to see for yourself! Our licensed and certified staff includes skilled nursing care that offers physical therapy, occupational therapy and speech therapy. These professionals combine their efforts to ensure that short term rehab leads to a speedy recovery. Their skills support independent living and a more active and rewarding life. We also work closely with ThedaCare, Affinity Health System and your personal physician to promote a healthy and engaging environment. Outside of Crossroads Care Center of Weyauwega is a tight-knit community of single-family homes, on tree-lined streets – a community that hasn’t surrendered to the hustle and bustle of the impersonal world beyond. Yet, inside, you’re still connected to that outside world with wireless internet service. You’ll also find a large chapel and an on-site beauty salon inside. Our Activities Director will sit down with you, one on one, to develop a schedule that is customized to your interests. You can attend concerts, play bingo, explore your creative side with arts and crafts, participate in the resident council or relax by our garden area. Our multi-purpose room is great for entertaining friends and family, as well as for games and other mentally stimulating opportunities planned by our Activities Director. It’s also a great place for physical exercise and aerobics that help to keep the body strong, too.